The national-conservative Law and Justice (PiS) party prevailed in the October 2015 elections gaining 235 out of 460 seats in parliament. Immediately after its inauguration the new PiS-administration launched some controversial policy initiatives, such as trying to reorganise Poland’s constitutional court, seizing direct control of the state broadcasting channels and the security services, and purging the heads of state-owned companies. This has triggered mass demonstrations in Poland, while the European Union is reviewing whether those moves violate EU statutes. 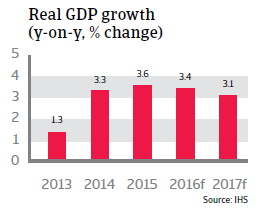 In recent years Poland’s economy grew at a substantially faster rate than the eurozone, and is expected to do so in the coming two years. 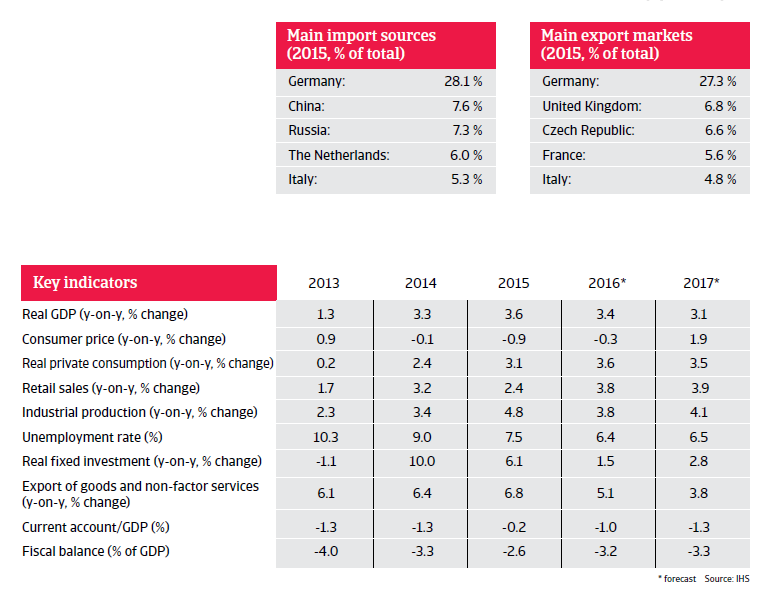 In 2015 Polish GDP increased 3.6%, mainly driven by private consumption, investment and exports. 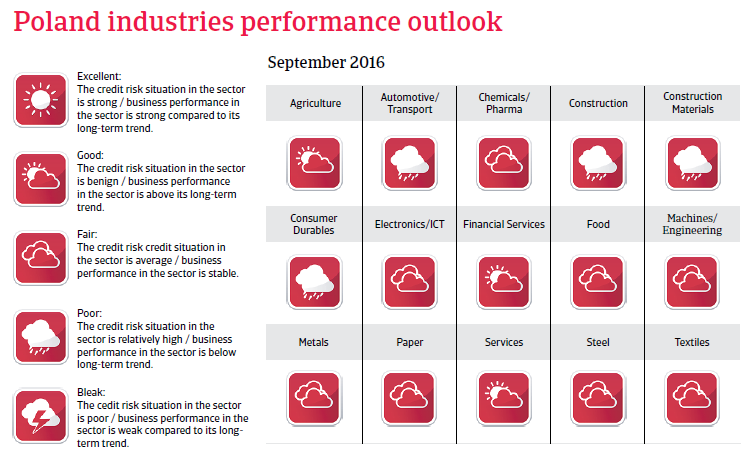 The Polish economy is expected to continue to benefit from low energy prices and the rebound in the eurozone in 2016, with GDP expected to grow 3.4%, based on robust domestic demand and increasing exports. In 2017 the economy is expected to grow 3.1%. Household consumption increase is driven by low energy prices as well as rising wages and employment. Consumer prices are expected to remain deflated in 2016. Demand for new jobs is growing and is highest in the industrial production and the education segments. 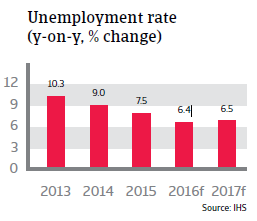 Unemployment is expected to decrease further, to 6.5% in 2017. 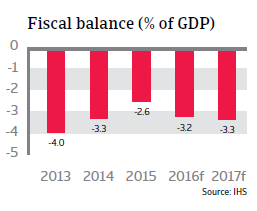 Poland´s fiscal deficit has been below the 3% Maastricht threshold since 2009, but is forecast to increase above 3% in 2016 and 2017, despite an additional tax on banks and large retail businesses. The increase is due to higher military spending as a reaction to Russia’s intervention in Ukraine, higher social spending and a reduction in the standard VAT rate. The current account deficit decreased to 0.1% of GDP in 2015, but is expected to increase again in 2016 and 2017 (to more than 1% of GDP) due to higher domestic demand boosting imports. During the 2008/2009 credit crisis, the Polish currency depreciated sharply against the euro. However, since then, the exchange rate has been relatively stable. Like its Eastern European peers, Poland is susceptible to a potential end of the current eurozone recovery. At the same time, domestic political woes and any adverse economic policies by the new PiS government could dampen investor sentiment in times of increased volatility and insecurity. In Central Europe, Poland's economy looks most vulnerable to the financial and economic fallout brought by the United Kingdom's vote to leave the EU. Annual remittances from Poles living abroad amount to about EUR 4 billion, a large share of it from the UK. In the longer term, an EU departure of the United Kingdom could impact EU structural funds, which play a major role for Poland´s economic progress. The UK is also Poland´s second largest export destination after Germany. Introduction of a retail tax could hurt businesses’ margins.